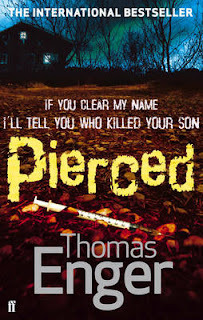 One of four Scandinavian crime novels nominated for this year's inaugural Petrona Award, PIERCED is the second in Norwegian writer Thomas Enger's series featuring online news journalist Henning Juul. In this instalment of the series, Juul is approached by convicted murderer Tore Pulli, former gangland enforcer turned celebrity property developer. Pulli has been found guilty of the murder of Jocke Brolenius, a thuggish Swedish enforcer, and prime suspect in the murder of a friend of Pulli's, Fighting Fit gym owner Vidar Fjell. As one of the injuries sustained by Brolenius was a "Pulli punch", a jawbreaking manoeuvre Pull was famous for in his enforcer days, and Pulli's knuckleduster (kept for sentimental reasons in the study of Pulli’s house!) was found at the scene, the case seemed crystal clear against Pulli. In the run up to his appeal, Pulli makes Juul an offer he can’t refuse - if Juul looks for evidence that will exonerate him of Brolenius’s murder, he will tell him what he knows about the fire that injured Juul, and killed Juul’s young son, Jonas. After Juul agrees to help Pulli, he calls in some favours due to his successful indentification of the villain of the previous novel in the series, BURNED. Juul can rely on the assistance of fellow journalist, Iver Gundersen, and his police acquaintances Brogelund and Pia Nockleby to obtain more information about Pulli and his world. Juul also discusses the case with the mysterious police informer 6tiermes7, who contacts him anonymously via online chat. Juul and Gundersen visit the gyms and bars frequented by Pulli and his shady group of friends to attempt to find out more from a group of people who are not significantly keener to talk to the media than to the police. Meanwhile in a separate strand of the novel, at first seemingly unrelated to the Pulli plotline, news camera-man, Thorleif Brenden and his partner are being stalked, and their idyllic upper middle class family life suddenly begins to be threatened. As in the previous novel in the series, BURNED, Juul remains a sympathetic hero, still struggling to deal with the loss of his son and plagued by nightmares and flashbacks, and amnesia, but mostly managing to function better in his day to day life than in the previous novel. Enger depicts character and milieu very convincingly, and gives a credible and interesting insight into both the frantic environment of online news journalism, and the violent, sweaty milieu of the muscled enforcers. For the most part the book remains a remarkably pacy page turner despite its fashionable 500 plus page length, though I did feel that some of the Brenden subplot could have been omitted, and that Brenden's complete failure to contemplate seeking help from the police at the start could have done with some explanation. The mysteries in Juul's personal life are not fully resolved, with a humdinger of a cliffhanger at the very end of this novel, leading nicely into the next entry in this top notch Scandinavian crime series.